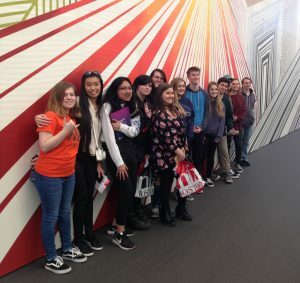 Juniors and Seniors from the Art and Music programs at OOBHS traveled to Boston on April 1. 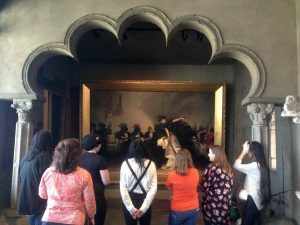 The day-long adventure included a guided tour at the Isabella Stewart Gardner Museum and an afternoon exploring at the Museum of Fine Arts. Students saw art and artifacts from all over the world, including a special exhibition of famed Mexican artist, Frida Kahlo, and the musical instrument room at the MFA. The trip was a learning experience for many by taking public transportation on the Amtrak Downeaster and traveling to and from North Station on the T. It was an inspiring and exciting day! Tuesday April 9th is SAT testing day. Junior College and Financial Aid Night! This important seminar for students and parents will be Wednesday, April 10th, from 6-7:30PM in the OOBHS cafeteria. That’s all for this week. Have a great vacation! A reminder that third quarter grades close today. Please don’t hesitate to contact your child’s teachers to make sure all work is completed. Grades will be emailed Friday, April 5th. For sophomores and juniors, Biddeford Regional Center of Technology applications are due today. Next Wednesday, April 3rd is an Early Release Day! Thursday, April 4th at 6PM in the cafeteria is senior scholarship information night. This is a very important meeting for seniors and their parents. We have may local scholarships to award. Please attend to learn how to take advantage of this wonderful opportunity for free money. Wednesday April 2nd is the date of the science MEA exam. Tuesday April 9th is SAT testing day. English with Ms. Kantro in room 108 on 4/1. Math with Mr. Lucchese in room 210 on 4/3. Congratulations to the OOBHS Jazz Combo and Jazz Ensemble who both received gold medals at the Maine State Jazz Festival in South Portland last weekend. Jazz Ensemble was the only high school awarded a gold medal in their division. Students who were named outstanding musicians included Trevor Grenier for combo, Vernon Wells for ensemble, and Nick Drown as outstanding musician in both divisions! English with Ms. Kantro in room 108 on 3/25, 4/1. Former Old Orchard Beach basketball players, both women and men, are needed for the 20th annual Alumni Basketball Classic scheduled for 6 p.m. Friday, March 15 in John Regan Gymnasium at Old Orchard Beach High School. Click for more info. Blood Drive Today at OOBHS in the Regan Gymnasium from 8AM-1PM, please come and donate! Congratulations to OOBHS and BRCOT students Leah Rubin, Breanna Perrigo, and Amy Nguyen, who were inducted last night into the National Technical Honor Society. Quite an accomplishment! Congratulations to Caitlin Perrigo, who has been named Saco Bay Rotary Club OOBHS March 2019 Student of the Month! Wednesday, April 4th at 6PM in the cafeteria is senior scholarship information night. This is a very important meeting for seniors and their parents. We have may local scholarships to award. Please attend to learn how to take advantage of this wonderful opportunity for free money. English with Ms. Kantro in room 108 on 3/18, 3/25, 4/1. Eighth grade step up night will be Wednesday, March 13th from 6-7:30 PM in the OOBHS cafeteria. Save the date! English with Ms. Kantro in room 108 on 3/11, 3/18, 3/25, 4/1. Food Service Facebook Page: Our Food Service Department has a facebook page, please click the link below to view It can also be found by searching for RSU 23 Food & Nutrition Services.Menus and changes and other information are posted. Old Orchard Beach High will be one of 10 public schools in Maine to move to eight-player football next season, following the lead of other small high schools in football-smitten states such as Nebraska and Oklahoma. Next Wednesday March 6th is an Early Release Day! The grading period for third quarter progress reports ends today. Progress reports will be available on powerschool next Wednesday. Congratulations to all of our winter athletes, thespians, musicians, and vocalists, on another great season! Playoffs, all state, a state championship. Wow! We are very proud of you! Students from OOBHS, Loranger, and Jameson submitted artwork to be exhibited at the Libby Memorial Library in Old Orchard Beach. The show is on view through Wednesday, March 6, 2019. Please stop by during regular library hours to see their wonderful work! English with Ms. Kantro in room 108 on, 3/4, 3/11, 3/18, 3/25, 4/1. Student Internship Agreement Forms are due to faculty advisors by today. To get full credit for this part of the Internship, the form needs to be turned in on time, with their May Intern schedule and all necessary signatures. Copies of the form can be picked up from Guidance or printed from the Internship Google classroom. More detailed information about the internship has been emailed to all seniors and senior parents/guardians. Please don’t hesitate to reach out to Mr. Pirrello or Ms. Hayes for support as needed (jpirrello@rsu23.org and jhayes@rsu23.org). *Seniors currently enrolled in a vocational program are exempt from this assignment and experience since this type of experience is already built into their voc. courses. It can also be found by searching for RSU 23 Food & Nutrition Services. Menus and changes and other information are posted.